Since the Nakba in 1947, Israel has displaced, brutalized and murdered Palestinians. The United States is Israel’s biggest supporter and regularly provides cover for the crimes committed by Israel. The US gives more money to Israel than to any other country, almost $135 billion since 1946. The last Memorandum of Understanding with Israel, signed by President Obama, gives a record $38 billion over ten years. The United States and Israel consistently vote as a bloc in the United Nations to oppose recognition of Palestine and to prevent criticism of Israel’s actions. During the six weeks of peaceful actions by Palestinians starting in March to demand their Right of Return, the United States tried to block a UN resolution calling on Israel to show constraint instead of injuring and murdering Palestinians, including children, reporters and medics. Fortunately, the resolution passed without the US in June. For these reasons, residents of the United States have a responsibility to demand that Israel is held accountable for its war crimes. To that end, a letter is being circulated for individuals, political parties and organizations to sign calling on the International Criminal Court to investigate Israel for its crimes against Palestinians. The letter, written by the Peace Action and International committees of the Green Party U.S., is being circulated globally for signatures. A delegation will deliver the letter in person to the ICC in November. Women of a Certain Age has signed on to the letter, as a group and as individuals. Here’s the link. The Women’s Boat to Gaza is an exciting new initiative of the Freedom Flotilla Coalition. Help us highlight the undeniable contributions and indomitable spirit of Palestinian women who have been central within the Palestinian struggle in Gaza, the West Bank, inside the Green Line, and in the Diaspora. Support the women organizers, passengers and crew from around the world to sail to break the siege. Gaza has been under Israeli blockade for the past decade during which time Israel has launched countless attacks against the besieged population, turning life into a nightmare and a continuous struggle. The physical wars have not only invaded the economy, markets and the land of Gaza, but have raided and assaulted homes, families, schools and museums, destroying civilization, heritage, culture, memory and hopes. Through Freedom Flotillas and other naval missions we have protested the passivity and complicity of the international community while calling for solidarity of civil society with the Palestinian resistance and a coherent response from western governments. The Women’s Boat to Gaza seeks to challenge the Israeli blockade, to show solidarity, and to bring a message of hope to the Palestinian people. With the support of women, men, non-governmental organizations, civil society, and from women’s collectives and events around the world, we will make this happen. We intend to officially launch this exciting project across the world on International Women’s Day, March 8, 2016 and we would like you to join us! We are calling for active participation of individuals and groups in this new campaign. Occupy Wall Street marches to Union Square. 100 arrested. The last 45 minutes the Spirit of Humanity is surrounded by Israeli gunboats, 100 miles away of Gaza port, into international waters. The Israelis ask the boat return to Larnaca. The boat continues its trip towards Gaza port. A former captain in the Israeli Air Force says Israel’s attack on Gaza will do nothing to stop the regions cycle of violence. He says the mainstream media is not telling the full story and is urging people to seek out independent and alternative news sources. Yonatan Shapira is a former captain in the Israeli Air Force Reserves. In 2003 Shapira initiated the group of Israeli Air Force pilots who refused to participate in attack missions on Palestinian territories. He is a co-founder of Combatants for Peace. He said today: “The big media is completely biased in not giving a true picture of the situation. People need to listen, watch and read alternative media sources. If you look at the number of people that were killed in the last few days the numbers for the Palestinians are enormous — over 375 people in Gaza! This is an open air prison controlled from all sides. People in Gaza cannot go out, can’t get the food, medicine, clean water, electricity they need and the Israeli Air Force is bombing them and killing innocent children in this crazy operation. The media are simply not telling this story. “Hamas fires rockets on Israeli towns and yes, four Israelis have been killed and these rockets can kill me and my family. But Israel’s retaliation and collective punishment will not bring us more security, just the opposite. The root cause of the conflict is the ongoing occupation and the refusal of the Israeli government to negotiate with Hamas and to agree to a complete withdrawal to 1967 borders. There’s no real intention to solve the problem by my government unfortunately. The scale of Israeli war escalated today by hitting more targets in various places across occupied Gaza. The army opened the new year with more military fatal actions in Gaza leaving more people dead. Trauma cases raise up and more people are suffering from the air raids. Many facets of harmed people can be found in Gaza. You either find a hit house with a dead one of the family or a hit house in which its residents traumatized and panics. Casualties of Israeli heavy bombings reached 415 while wounded rise up to 2100 persons. Many wounded are in critical condition and there is no ability to respond to their deteriorated cases. Israeli Foreign Affairs Minister, Tsivi Livini, declared that Israel is only targeting Hamas members indicating that Gaza doesn’t suffer from any shortages of humanitarian needs. However, the incoming humanitarian needs are not enough for the populations amounted of 1.5 million. United nation debunks the allegation of Mrs. Livini and says the incoming materials are not enough. Gaza needs 100 vans of flour. Karin Abu zaid the general commissioner of UNRWA said also that around 20 thousand people face troubles in getting the food supplies. Main Israeli Military Actions in Gaza:* *Now: Loud bombings in all Gaza City and north of Gaza. Naval fire, F16s, Apaches and tanks heavily bombs many targets and darkness prevail Gaza. Israel asks International journalists and peace activists to leave Gaza tomorrow. Israeli army broke into local radios and tunes some statement for people. Israeli F16s destroyed civic defense station and a local organization in the north of Gaza city of Bait Hanon. Many houses partially destroyed. Rockets of F16s hit a target in Al Zaytoun area in Gaza City. More bombings in some areas west of Gaza City. ** Heavy bombings in East of Gaza. A house next to an ex-Hamas member destroyed in Al shja’ya area. No news about conditions of house residents. Israeli F16s bombed the run Palestinian legislative Council. The air raid destroyed half of the premises and caused massive damage in some of the neighboring houses. Israeli heavy artillery takes part in the military operation by hitting many targets in Gaza. Many parts in the eastern areas of Gaza were shelled. A house destroyed mid of Gaza city, Al Sabra Quarter, leaving around 13 injured. Most of the wounded are women and children who also turned traumatized. Israeli F16s raided on the house of Nizar Rayan, a Hamas key leader. The house is based in Jabalia camp where thousands live in that small refugee camp. Nine Palestinians between children and women killed due to the bombing of Rayan’s house. Some of the killed children were playing near the targeted house. Five houses partially damaged while bombing Rayan’s house and several other got deadly shrapnel. Israeli heavy F16s’ rockets destroyed the Agricultural College of Bait Hanon, north of Gaza Strip. Israeli navy bombs Gaza shores and opens its heavy fire on some buildings, boats and security offices. Many shells fall down behind some densely populated buildings north of Gaza. Trauma across the Nusairat Refugee Camp as Israel hit the house of Ahmed Abu Nader twice. The house was totally damaged while neighboring houses partially damaged. Israeli F16s raided on a house of Tawfiq Abu Al Ros, in Al Nusairat Refugee Camp. Many civilians injured. A house of Hani Abu Al Amrain in Al Shaikh Ridawan area bombed by Israeli Air forces. Medical sources reported that many wounded arrived at Al Shifa’ hospital. A number of wounded resulted in a rocket hit a house for a Hamas member in Rafah. Israeli Air forced totally destroyed two mosques by heavy rockets in Khan Younis and Rafah cties. Few vans of aids, food stuff and medical aids arrived into Gaza. Arab governments to send urgent medical and food aids to Gaza. Airborne assistance expected to land in Al Araish Egyptian airport near Gaza. Neither fuel, nor gasoline nor Benzin in Gaza. Power cuts up to 21 hours. All aspects of life are not longer available in Gaza. Neither spare parts nor Gasoline available to operate pumps of fresh water. A great number of Palestinians don’t have an easy access for fresh drinking water. Palestinian factions retaliate against Israeli air raids in Gaza. Around 50 homemade rockets fired into Israel with no casualties. (Lebanon, Tuesday 30 December) – Today the Free Gaza ship “Dignity” carefully made its way to safe harbor in Tyre, Lebanon’s southern-most port city, after receiving serious structural damage when Israeli warships rammed its bow and the port side. Waiting to greet the passengers and crew were thousands of Lebanese who came out to show their solidarity with this attempt to deliver volunteer doctors and desperately needed medical supplies to war-ravaged Gaza. The Lebanese government has pledged to provide a forensic analysis of what happened in the dark morning, when Israel rammed the civilian ship in international waters, and put the people on board in danger of losing their lives. The Dignity departed from Larnaca Port in Cyprus at 7pm (UST) on Monday 29 December with a cargo of over 3 tons of desperately needed medical supplies donated to Gaza by the people of Cyprus. Three surgeons were also aboard, traveling to Gaza to volunteer in overwhelmed hospitals and clinics. The ship was searched by Cypriot Port authorities prior to departure, and its passenger list was made public. Delivering doctors and urgently needed medical supplies to civilians is a just such a “peaceful purpose.” Deliberately ramming a mercy ship and endangering its passengers is an act of terrorism. CALL the Israeli Government and demand that it immediately STOP attacking the civilian population of Gaza and STOP using violence to prevent human rights and humanitarian assistance to the Palestinian people. The Free Gaza Movement, a human rights group, sent two boats to Gaza in August 2008. These were the first international boats to land in the port in 41 years. Since August, four more voyages were successful, taking Parliamentarians, human rights workers, and other dignitaries to witness the effects of Israel’s draconian policies on the civilians of Gaza. I was at a loss for words to express all the brutality of the Israeli attack on Gaza. The following message of the distinguished and courageous British writer and art critic, John Berger came to my rescue. “We are now spectators of the latest – and perhaps penultimate – chapter of the 60 year old conflict between Israel and the Palestinian people. About the complexities of this tragic conflict billions of words have been pronounced, defending one side or the other. This is what the Israeli State and the world media more or less – with marginal questioning – mindlessly repeat. And this claim, which has accompanied and justified the longest Occupation of foreign territories in 20th C. European history, is viscerally racist. That the Jewish people should accept this, that the world should concur, that the Palestinians should submit to it – is one of history’s ironic jokes. There’s no laughter anywhere. We can, however, refute it, more and more vocally. second appearance in court in Kiryat Gat. of Gaza is the real crime”. human rights workers. Three earlier missions made landfall in Gaza in August, October, and November through the power of non-violent direct action and civil resistance. The Free Gaza ships are the first international ships to reach the Gaza Strip in over 41 years. LARNACA – The Free Gaza Movement is delighted to announce that their third boat, the SS Dignity carrying 27 crew and passengers arrived in Gaza at 8:10 Gaza time, in spite of Israeli threats to stop them. In the pouring rain, the boat pulled into port amid cheers from the people of Gaza and tears from the passengers. Read more…. GAZA CITY, FREE PALESTINE (29 October 2008) – This morning I walked to the Indian Ocean and made salt in defiance of the British Occupation of India. This morning I marched in Selma, I stood down tanks in Tiannamen Square, and I helped tear down the Berlin Wall. This morning I became a Freedom Rider. Read more…. Read an open letter from Huwaida Arraf, the daughter-in-law of one of our WCA members, who is on the boat to Gaza. Click here. GAZA CITY, 26 August 2008) – The SS Free Gaza and SS Liberty will leave Gaza for Cyprus on Thursday morning at 9:00 am. Several Palestinian students who have been denied exit visas by Israel will travel to Cyprus on the boats. One Palestinian professor will finally be able to go back to teaching in Europe and one young, Palestinian woman will finally be reunited with her husband. Several of the Free Gaza international human rights workers will remain in Gaza to do human rights monitoring. By freely traveling to Gaza, on Saturday, August 23rd, in two, small, wooden boats, the Free Gaza Movement forced the Israeli government to issue a fundamental policy change regarding their military and economic blockade of Gaza. Until now, Israel has wanted absolute control of Gaza with no responsibility. Israel has managed to maintain this situation, in spite of international law, because its policies have never been challenged. When the SS Free Gaza and SS Liberty approached the waters of Gaza, the Israeli government had to decide whether it wanted to publicly acknowledge that Israel remains an occupying power in Gaza, in which case Israel would be responsible under international law for its actions, including war crimes. In the face of intense, public scrutiny, Israel instead chose to acknowledge the inherent right of Palestinians to freely engage with the world. The Israeli Ministry of Foreign affairs publicly announced that humanitarian and human rights missions to Gaza will no longer be stopped or threatened by Israel. With the end of the Israeli siege of Gaza, Palestinians are free to exercise their rights without fear of being stopped or killed by the Israeli military. Since the organizers of the Free Gaza Movement will not be entering Israeli territorial waters, and since they will request an inspection from the Gaza Port Authority, they expect no interference on the part of the Israeli authorities when they leave Gaza. By Israel’s own admission, it has no authority to inspect the boats or the passengers when they leave Gaza. With the collapse of the Israeli blockade, the Free Gaza Movement will quickly return to Gaza with another delegation, and invites the United Nations, Arab League and international community to organize similar human rights and humanitarian efforts. The Free Gaza Movement will continue to work to ensure the free passage between Gaza and the outside world will remain safe and open. such as hearing aids, batteries for medical equipment, and painkillers. the world responded. Governments and civilians alike rallied to help. taking up overseas academic opportunities. living. We hope our presence will keep the Israeli military at bay. entire people being slowly and purposefully starved and humiliated. elected representatives will one day follow our example. Press on her behalf by the Institute for Middle East Understanding. It was a day of smiles and a day of tears for me here in Gaza City. Another early press conference, followed by a visit to the hospital which has seen most of the carnage created in Gaza by Israeli bombs and rockets. The doctor related some of the difficulties faced by the population of Gaza. That 50 children have died because Israel refused to let them enter Israel for treatment. The reason given by Israel? The mothers were under 35 years old and could be terrorists. So the children died. He told us that so far 242 people have died during the siege because of Israel’s refusal to allow them to get the treatment they need. And that there have been 300 deliveries at checkpoints, resulting in 69 babies dead. Next to visit some patients. We didn’t see any victims of this violence there. One small boy, clearly very ill, maybe 7 or 8 years old. He held his mother’s hand and tried to smile at us at she told us he will die without an operation that cannot be performed in Gaza. The Israelis won’t let him into Israel or the West Bank for treatment. Then we went to the neonatal unit where a dozen babies you could hold in your hand were struggling to survive in patched up incubators. Some were just tiny, some had bandages, all were breathing through tubes. Their tiny chests rose and fell, some moved, opened their eyes, cried out, waved arms or legs. They didn’t seem to be ill, just very tiny. In an American hospital I’m sure they would all survive and thrive. Here we know their lives are fragile because they depend on the electricity it takes to keep their incubators working. They are just little babies… all different. Some fair, some darker, some red faced… some with hair, some without. They could be Arab babies, or Jewish babies, or Christian babies, or Muslim babies. They are Palestinian babies, and they deserve to grow into healthy Palestinian children and adults. I wonder how it can be that some people believe the lives of Palestinian babies are less precious than those of any others? We went to the kidney dialysis unit, where 7 or 8 adults were getting their treatment. The doctors told us that often the patients must wait for hours until there is enough electricity for the machines. Israel usually allows them 12 hours of electricity per day, but sometimes only 6, so they constantly fear the machines will stop in the middle of treatment, which sometimes happens. They said also that Israel will not let them import necessary parts to keep the machines, and the incubators, operating properly, or let them have the solution needed to cleanse the blood of the dialysis patients. And then to lunch with Prime Minister Ismail Hanyeh at his house inside the refugee camp. He greeted each of us individually, and told us we are now citizens of Palestine. He placed a large medal around each of our necks and spoke to us about who we are, and we were able to respond. After lunch he led us into several of the tiny houses, often a single room without furniture, where he and we were greeted warmly by the Prime Minister’s neighbors and their children. As always the people and the children were friendly and welcoming, greeting us with smiles and reaching out their hands to us. Many of the women folded me and the other women into their arms, or touched our faces, and kissed us, always telling us “thank you for coming” or “welcome to Gaza.” The children were everywhere, running through the narrow alleyways of the camp, waving to us, calling out to us “what’s your name?” and a few hiding behind their mothers, too shy to come near us. One little boy of around three dragged his green blanket around in the narrow little alley, reminding me of my own granddaughter who drags around a green blanket that I knitted for her when she was born. Afterwards we went to the big outdoor market in downtown Gaza City. There are so many people… it’s such a little strip of land for a million and a half people. Everywhere they waved to us, smiled, held up their fingers in a peace sign. A flatbed truck pulled up beside our bus and we were entertained by a band playing just for us. We walked a lot today, and saw a thousand smiling faces. So here we are in Gaza, and we haven’t seen a single Israeli with a gun. Just three unarmed Israelis who sailed with us on this remarkable voyage. Tomorrow at 4:30 AM some of us are going out with the Gaza fishermen in their boats to see what we can catch. We hope our presence will provide some degree of protection for these men and boys who risk injury and death from Israeli guns each time they try to work their trade in the waters off the coast of Gaza. 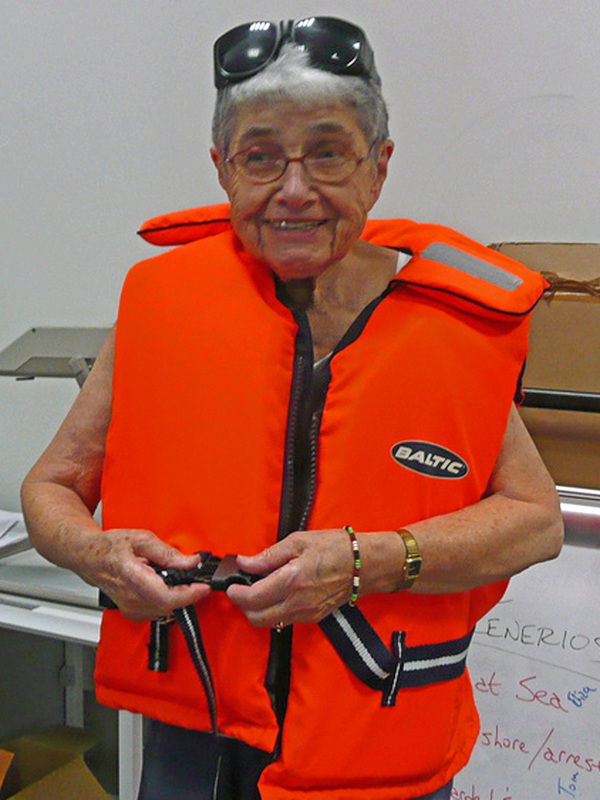 WCA’s Hedy Epstein, Greta and Mary will be on board the Break the Siege boat. Around 60 Palestinians, Israelis and Internationals from 15 countries will sail to Gaza during the sixty-year anniversary of the Nakba – the forcible expulsion of more than 700,000 Palestinians from their lands to create Israel –to challenge Israeli control over the open-air prison called Gaza. Among the crew are a Holocaust survivor and a survivor of the Palestinian Nakba. They sail with the common bond of focusing the world’s attention on the growing humanitarian crisis in Gaza and its collapsing economy which are direct results of Israel’s ongoing occupation and continuing control over Gaza’s air space and territorial waters. “The siege of Gaza ends only when Palestinians are accorded the basic fundamental human rights of citizens throughout the free world,” says UK passenger, Musheir El-Farra who knows the irreparable human cost of current Israeli government policies. “My family and beloved ones in Gaza have been under siege for over two years now; living without their most basic human rights on their own land. In the words of Holocaust survivor Hedy Epstein “What an opportunity to make a change for good, both for Palestinians and Israelis. We intend to open the port, fish with the fishermen, help in the clinics, and work in the schools. But we also intend to remind the world that we will not stand by and watch 1.5 million people suffer death by starvation and disease”. The Free Gaza movement has been invited to Gaza by the Red Crescent Society for the Gaza Strip, the Palestinian Medical Relief Society, Palestinian Centre for Human Rights and the Gaza Community Mental Health Program. Boat passengers will be available for interview prior to the boats leaving Cyprus (between 1st and 5th August) and during the voyage via satellite phone. Please contact us to arrange interviews. *Nicosia/Lefkosia, Cyprus, August 7. * The Free Gaza Movement announced today that their boats, destined to break the Israelis’ siege of Gaza, will arrive in Chania, Crete, on Saturday, August 9, at 9 p.m. and that a press conference will be held to welcome their arrival. Internationals are gathering across the world – in Beijing and Cyprus – with the common dream of peace and justice for everyone. Human rights activists Lauren Booth, journalist, (sister-in-law of former British Prime Minister Tony Blair), Huwaida Arraf (a Palestinian-American residing in Ramallah, Palestine), and Jeff Halper (an Israeli Jew who was nominated for the 2006 Nobel Peace Prize for opposing demolitions of Palestinian homes) will be available at the press conference for interviews. “This will be the first time that our two boats will be publicly displayed and photographers are welcome to come, take photos and post their images,” said Paul Larudee, on board the boats sailing toward Chania. It may be later than we originally planned, but we are more determined than ever to go to Gaza. By now, almost half of the people are on board or traveling to the boats, and those of us left in Cyprus are finishing up our training, working on banners and trying to control our impatience. When we called the people of Gaza to tell them we would arrive a week late, their reply was, “Don’t worry. We know you are coming. And we are waiting,” a testament to their confidence that 40 Internationals, two small boats, and tremendous media attention can somehow defeat the Israeli Navy. What is the possibility of you and the crew of the SS Liberty throwing 34 long stemmed roses into the sea as a memorial to the 34 Americans who were killed aboard the USS LIberty? We will pay for the roses or whatever else you have in mind. I guarantee you our newspaper American Free Press will give a HUGE spread in the paper for it. The survivors of the LIberty and their familes would be eternally grateful to you and your ship mates for this gesture as no one has ever done anything like this before. SS Liberty. I was the petty officer in charge of the body recovery and identification, and I remember it almost like it was yesterday. So, when we leave Cyprus, we hope to have a ceremony for all of those Americans killed by the Israelis on board the ship in 1967. The tragic death of ten-year-old Abir Aramin made headlines worldwide. Abir was only one of 922 child victims of the Israeli Occupation since September 2000, but she was also the daughter of Bassam Aramin, a well known activist and founding member of Combatants for Peace. The group engages Israelis and Palestinians who have taken an active role in the cycle of violence but who have put down their guns in order to fight for peace. These men rallied around Bassam and his family, transforming grief into a project to memorialize Abir and insure that her death would leave a legacy of healing and hope. Abir was walking home from school with her sister and two friends in the West Bank town of Anata on January 16th 2007, but never made it back to her family. On this day the Israeli Border Police opened fire at the children walking home. Abir was hit with a rubber bullet to the head and fatally wounded. Provocations by the Israeli Border Police or Army had become a daily routine in the Anata school district in the two years since construction of the separation barrier began. Public outcry over Abir’s death was loud enough to demand a police investigation, but the case was closed before testimony was heard from Palestinian witnesses. Hundreds of people protested this decision in Tel Aviv. Together, members of Combatants for Peace will build “Abir’s Garden”, a safe place where Palestinian children can play and grow. Abir’s Garden seeks to keep the memory of Abir alive, by pursuing justice in her legal case, advocating for children in school zones, and building a playground and memorial. Plans donated by a landscape architect will place 2 playgrounds, a fountain, gardens, sports areas and more on the bleak grounds of the Anata Girls’ School. Combatants for Peace has teamed up with an American NGO, the Rebuilding Alliance, to raise funds for the project. Visit the Rebuilding Alliance for more information about Abir’s Garden and how to support it.